Come to that, where is Scooby Doo? Shouldn’t he be with those crazy kids in the Big Smoke’s syewers (sic) trying to take shots of scary Cyberm’n (one of them’s sick). It’s all because of The Invasion, masterminded by perma-winking Tobias Vaughn and his woefully inept sidekick (and arse-kick), Packer. The Doctor has an eye for a photo opportunity, courtesy of our snappy flapper, but Jamie proves not to be as photogenic as Zoe’s spangly bottom, despite his family-friendly weighted kilt. And the jury’s still out as to whether his dirk is more impressive than Jimmy Turner’s chopper. Does Cyber-Plan B make any sense? Why hasn’t Vaughn killed Packer several times by now? And should we petition Philip Morris to recover the missing action sequences? See if anything “has been agreeed” by Jim and Martin in this mammoth episode. You’ll need the stamina of a Cyberm’n to listen to it all. As with most good science fiction, writers Kit Pedler and Gerry Davis took a recent series of technological innovations and imagined a potential logical conclusion. At the time, pacemakers, prosthetic limbs and artificial implants were all prolonging life and mobility for the sick and injured. A good thing surely to harness new technology in this way? But where do you stop? Should you stop? If something’s broken, then surely you fix it? But in fiction, at least, those who attempt to play God are always punished and the Cybermen paid dearly for their actions. Not that they were ever able to realise it. Here then was the unique selling point for the Cybermen. Made almost indestructible by their physiological enhancement, they lost the vital component that would allow them to use their new-found power for good: their emotions. The loss of emotion might be seen as a welcome release from negative feelings, like despair and heartache, and this idea was explored with the Danny Pink character in the series 8 finale. But this lack of emotion robs the Cybermen of the joys of flowers, sunsets and well-prepared meals too. And also renders them pitiless, remorseless and terrifying. While the Daleks are organic mutations in armoured tanks, driven insane by hate, their would-be successors in the Doctor Who canon, though similarly encased in metal, developed a more abstract deformity. The 1970s US series The Six Million Dollar Man showed us the advantages of partial cybernisation. Because Steve Austin was left with his mind intact, he could use his new abilities as a secret agent – for ‘good’, within the frame of reference of that series. But as the Cybermen found to their cost with Tobias Vaughn in The Invasion, partly converting a human without enslaving the brain, can be counter-productive. So what happens when the human brain is also replaced by a computer? Well number-crunching may now be a breeze but that which made you ‘human’ is now absent. You will no longer know nor care about your loved ones. You will have no compassion for others, no concept of right and wrong even – only a cold, logical approach to achieving your goals. And what could be more frightening than a race of creatures like that? The answer is such a race wanting to make you as they are. So this is where the Cybermen succeed as a Doctor Who adversary: they’re coming to get you and, if they don’t kill you, they’ll subject you to painful surgery in order to steal your body and mind and recruit you to their army of the living dead. And this body horror is a crucial component of their success. We see the silver giants first in The Tenth Planet, as cloth-faced semi-zombies – heavily augmented but with their hands still intact. We know them to be immensely strong so their arms must be hybrids of flesh, bone, steel and plastic. And their faces… bandaged after a horrific series of operations? It’s never made clear but the larynx has certainly been replaced with something electronic, operated by moving the apparently still-organic jaw. Glimpses of real eyes can be detected behind the dark eye panels on their faces. This may be more by accident more than design in production terms but it certainly adds to the eeriness of the overall effect. But as early as their second story, The Moonbase, they seem to be little more than robots and this status has continued to this day, save a glimpse of some organic-looking lower jaws in Earthshock. It was a great shame to lose the more visibly human characteristics of the original design. 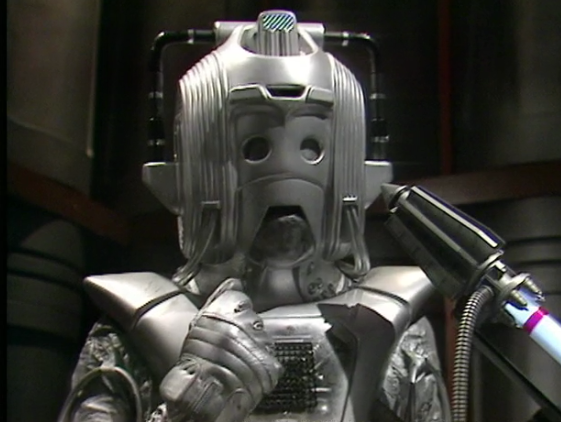 The Cybermen are so much scarier if you imagine organic material clinging to life within the metal exoskeleton. But the body horror element lost in their redesign was to be transferred to the treatment of their victims. But perhaps the most disturbing depiction of the pains of cyber-conversion is Lytton’s grisly fate in Attack of the Cybermen. We last see him part-way through the process – mindless, butchered and barely alive. The 21st century incarnation of Doctor Who also delivered a gruesome re-imagining of the cybernisation process in The Age of Steel: an automated assembly line of whirring blades and humans lined up to enter, like livestock in an abattoir. 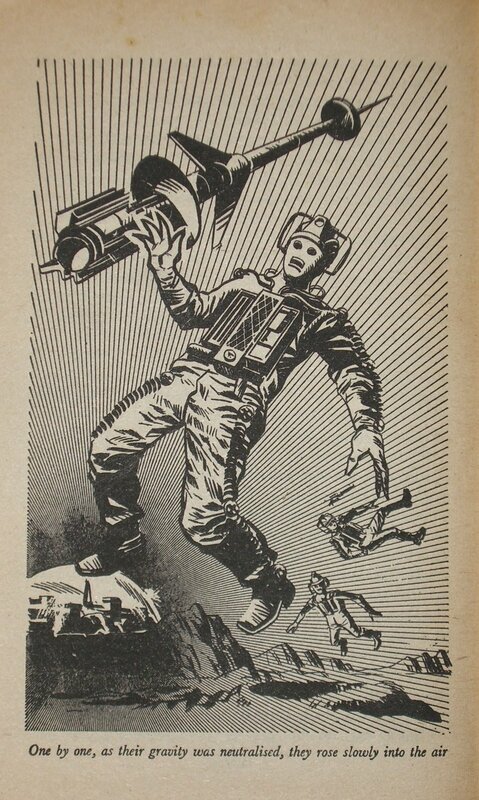 But now we have Cybermen who can remove heads and limbs at will and so, it would seem, are finally entirely robotic. Their ability to upgrade instantly in order to overcome their opponents makes them so dangerous that whole planets are destroyed just to stop their advance. 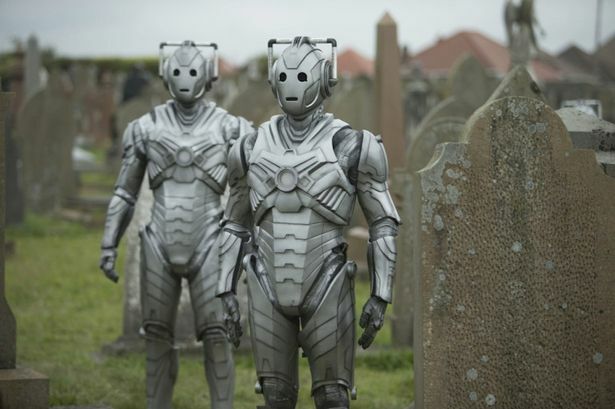 And their latest outing presents us with new Cybermen spawned from the long-dead by a form of cybernising pollen. 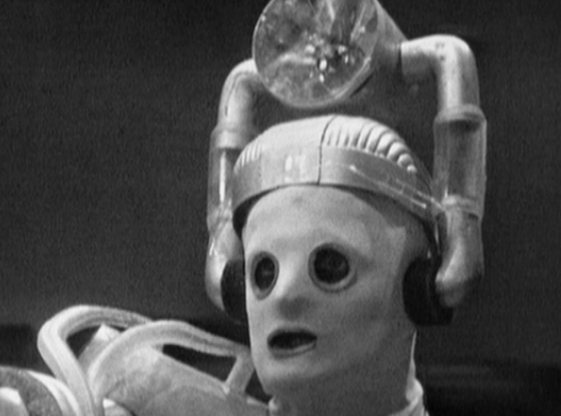 So we have never been further away from the original concept of the Cybermen. If the replacement of body parts is no longer a concept that provokes even a slight feeling of unease then perhaps it’s time the Cybermen were laid to rest, as this was the idea behind their creation and the key to their success. Let other alien races stomp around in unison, upgrade instantly and weaponise the dead. The Cybermen should be powerful and menacing, yes, but essentially just like you and me – if we were to lack that crucial spark of humanity. Now that is truly frightening. Well, if the Cybermen are that bloomin’ clever, they’d target the more body-conscious members of The Moonbase crew with their veiny virus too. But they reckon without Gollum Doctor, a lead-swinging Jamie, Polly the Barista, and Ben “Know-it-all” Jackson. Sadly Jim and Martin don’t, and consequently bang on at some length here about 1967’s chilling Troughton tale, The Tomb of the Cybermen. It’s a four-episode epic involving awful accents, anxious archaeologists and cute and convenient handbag-size hit-mice. Gasp as Victoria falls asleep, Jamie falls into a trance and the Doctor nearly falls from grace as he plays impromptu puppet master – handy really as there’s a Toberman on strings and an under-stuffed, self-decapitating metal manikin to contend with. Yes, it’s the 1975 space opera, Revenge of the Cybermen, in which our intrepid TARDIS team battle a slimy U-Boat commander, an emotional silver giant and a horde of mad blinged-up old women. The Doctor’s narcoleptic, Harry’s apoplectic and Sarah may well go septic so take the slow train with Jim and Martin and see whether all that glitters is gold.